Automated production testing is critical in today’s competitive manufacturing environment. Companies can no longer rely on variable costs, non-uniformity, and potential health hazards that come with a laborer-based manufacturing line. This is no less true for sound and vibration tests, ranging from in-process burn-in tests to product validation and verification tests. The measurement tools and intelligence behind present day manufacturing include data acquisition equipment as well as closed-loop control. And while these systems may not take part in the assembly of any goods, they are just as important to ensure quality control for both components coming into an assembly line and products going out. Crystal Instruments has evolved a synergistic solution to such testing involving custom hardware and application-focused software. 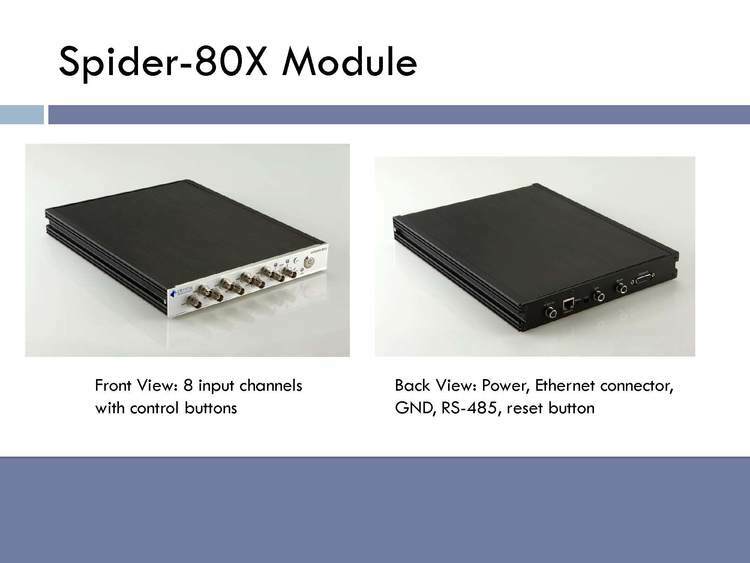 Our Spider-80X module is a complete multi-channel analyzer/controller with IEEE 1588 Precision Time Protocol (PTP) time Ethernet communication. It can be programmed to accomplish multiple complex measurement tasks using a workstation or PC and our Engineering Data Management (EDM) software. Thereafter, the PC can be (optionally) disconnected and tests run in “Black Box” mode without an attached computer. 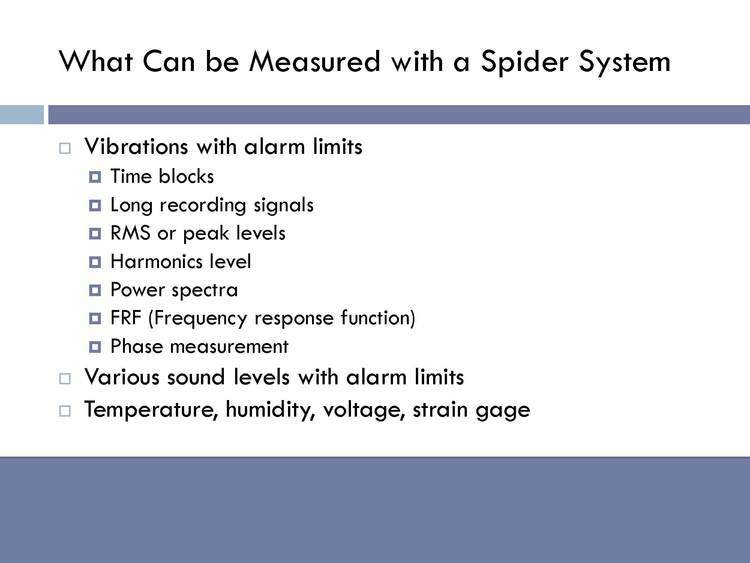 Control of the Spider may be accomplished through an Apple iPad™ tablet using our EDM App for iPad. 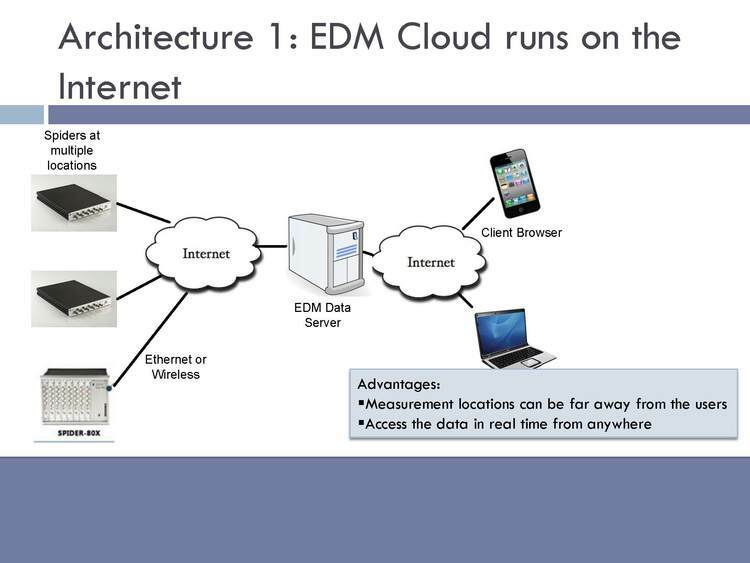 EDM serves as the standardized human interface to all of our Vibration Control Systems (VCS) and Dynamic Signal Analyzers (DSA). Regardless of the specific application, channel count or language (English, Japanese, Chinese, Russian) the user interface presents the same “look and feel”. Through EDM, the user can create custom interfaces and greatly simplified operating interfaces for specific product tests. Users can also generate custom reports using XML, OpenOffice, PDF, and Microsoft Word templates. The Spider API is the gateway to integration with LabView, Matlab and other scripting software. Spiders can be run from Android, Linux and iOS in addition to Microsoft Windows. 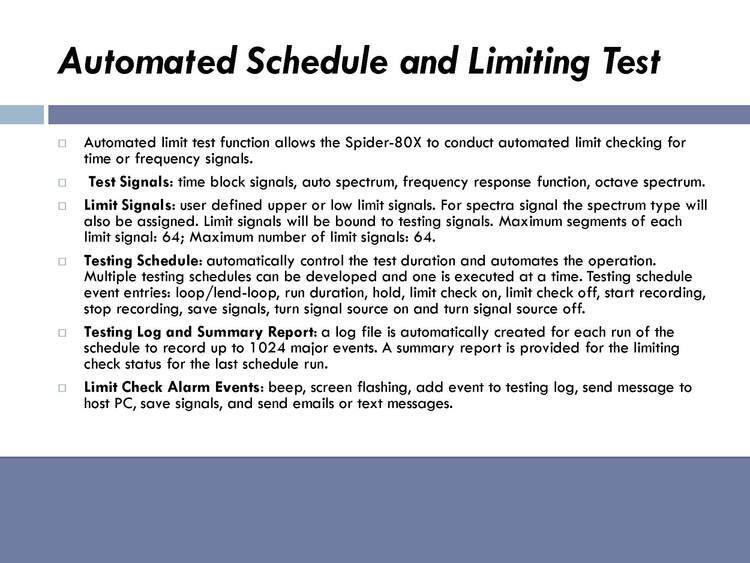 A single iPhone, tablet or PC can control multiple spiders at distributed locations running disparate tests from a single control screen. 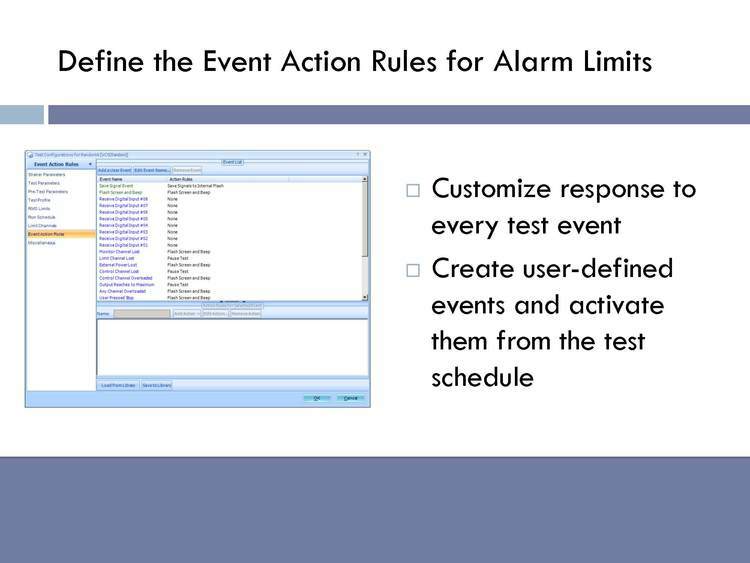 Event-Action Rules (EAR) allows users to customize the system’s response to every test event. 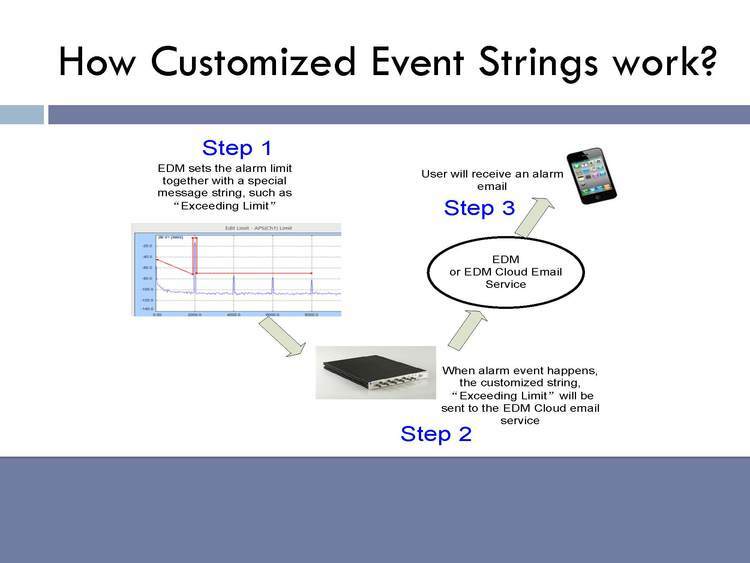 User defined events include: signal exceeds a limit profile, signal is less than a limit profile, normal end-of-test, loss-of-signal or any of number of the events encountered during a VCS test. 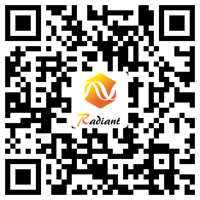 Responses include: halting a test, starting a different test, flashing the control screen, initiating a recording, sending a screen message, sending a text message, or sending an e-mail. Users can program loops using EAR. 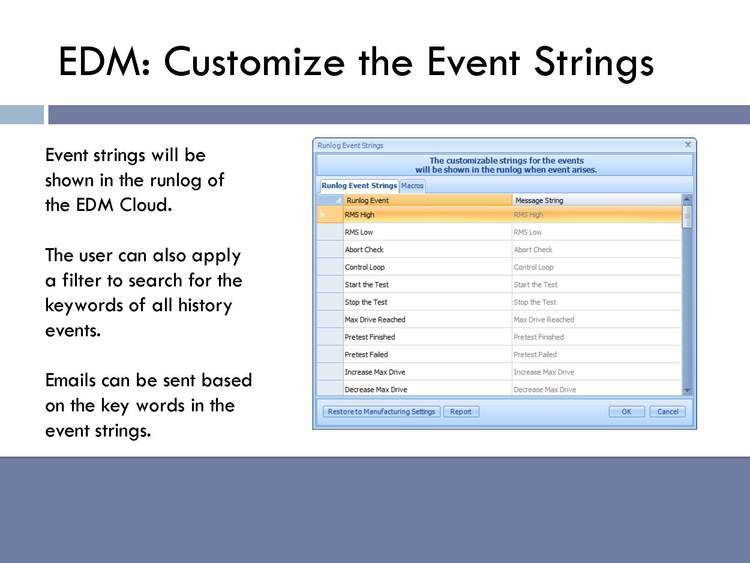 Every event is logged on a cloud server and is identified by the text of a customized event string (only on EDM Cloud). 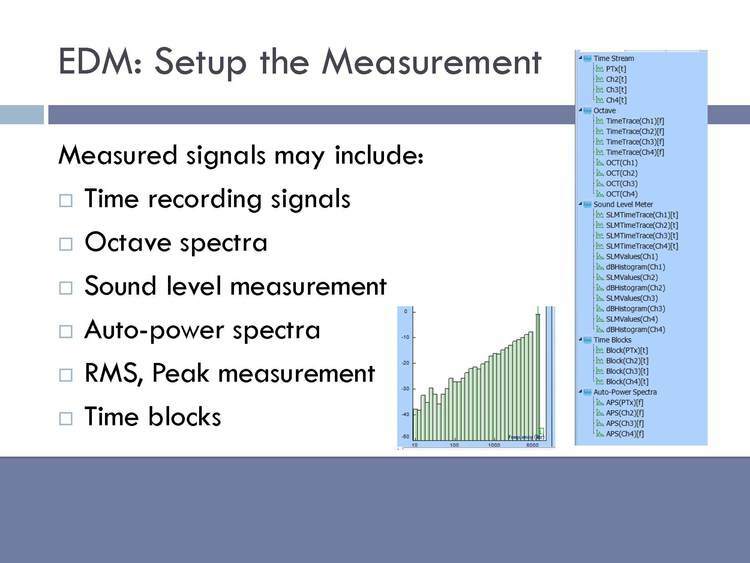 Limit Testing (LT) may be applied to a Time Block, Auto Spectrum, FRF, Coherence, Octave Spectrum, Sound-Level Measurements, RMS or Peak value. Spectra and time histories are tested by comparing against a custom test signal; a template which must bound the measured signal. Each test signal may be either an upper or lower limit and may contain up to 64 segments. Up to 64 test signals may be applied to a single measurement. Burn-in testing for electronic products is a type of testing that is easily automated with sound and vibration instrumentation. For example, consider cell phones, a consumer product produced in the thousands which contains both a microphone and a speaker. These two audio components almost always need to be run through a burn-in test, which is easily automated using the Spider-80X. The Spider-80X provides a stimulating programmable function generator and data collecting input channels. The methods for testing vary but the principles remain the same. One of the two output channels of the Spider-80X runs through a series of tones or pulses to test the phone’s receiver while the input channels listen to a prerecorded sound clip played out through the speaker. 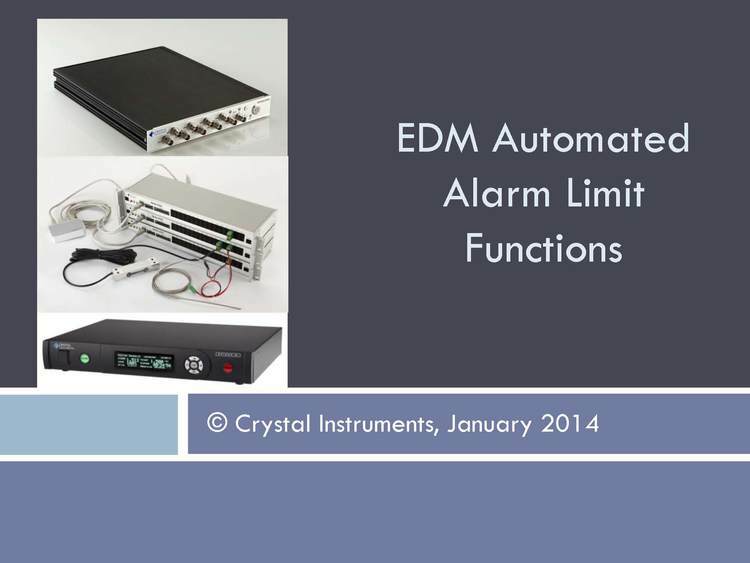 Either time waveform data or spectral data can be collected and pass/fail tolerances set within Crystal Instruments Engineering Data Management (EDM) software. Scalability is a one of the benefits of automation and this is why the Spider-80X is designed as a networked device. 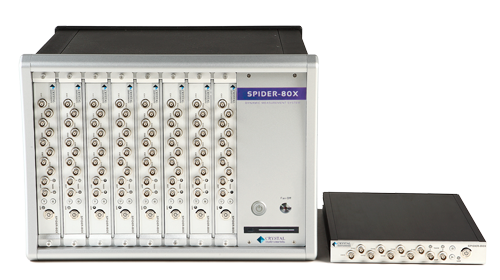 With an Ethernet connection on the Spider-80X, multiple front-ends are connected to test tens if not hundreds of cell phones at a time. This may seem a bit excessive until one considers using not just a single microphone per cell-phone but rather using a microphone array to capture and map a planer response or even a 3-dimensional hemi-sphere of sound around the cell phone. However, burn-in tests are not the only type of automated production tests performed with sound and vibration instrumentation. Product validation and verification are also an important part of production line testing. Such tests range from validating incoming components to verifying a finished product assembled from them. Virtually all turbine manufacturers carefully match-tune the component blades of their steam and gas turbines. This involves accurately measuring the natural frequency of one or more vibration modes of each blade individually, while the blade is root-restrained by a standardized fixture. Different manufacturers implement such tests in various manners, but all rely upon measuring the forced vibration response of the blade. The most accurate frequency determinations are made from Frequency Response Functions (FRF), wherein both the stimulating force and resulting vibration are simultaneously measured. Other products are quality-audited for consistent natural frequencies, to indicating consistent geometry. Often, the damping factor of each mode is also measured and used as an indication of proper assembly and freedom from cracked components. As an example, large artillery shells are impulse-tested using an instrumented hammer and a microphone. When struck, the shell rings like a bell. Each shell must exhibit natural frequencies within an acceptable scatter-band. Shells with high damping factors are subsequently inspected for cracks. Frequency Response Functions characterize the linear relationship between a measured input and output and convey an enormous amount of information. An accompanying two-channel measurement, the Coherence Function, determines if two signals are linearly related. It is an ideal indicator of throughput linearity, an important characteristic of most electronic circuits and many mechanical structures. 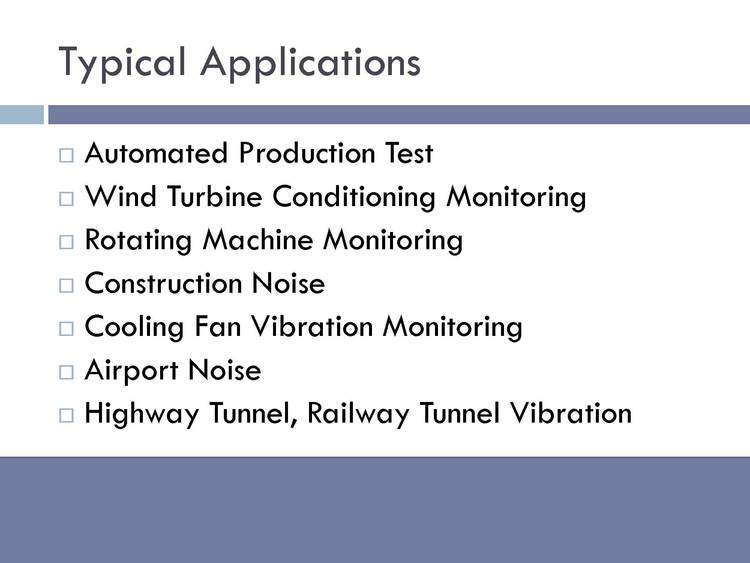 Automated production tests relying on sound and vibration are a solution. While testing techniques may vary the end goal remains the same; namely to screen out bad products from coming in or going out the door. Here the Spider-80X offers distinct advantages depending on the production line. For a moving production line the Spider-80X can be set to accept a non-contact laser displacement probe for vibration measurements. 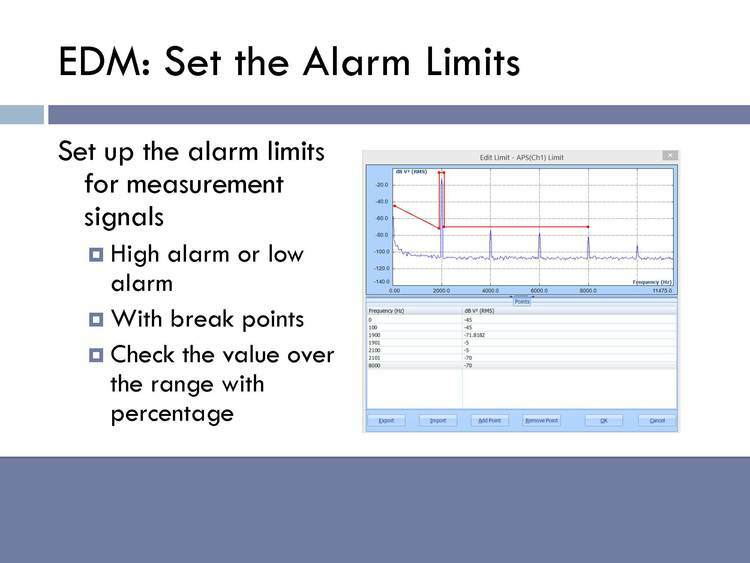 Download the full presentation on Automated Limit Functions here.